We hear it all the time: Once you drive a Marathon, you’ll find nothing else compares. Come in, take a test drive. You’ll find it’s easier to handle and the ride is smoother than you’ve ever imagined. Prefer to skip the driving and hire a driver? We can assist you with that, too. Our vehicles’ directional stability, handling and quiet, ultra-smooth ride rival the feel of the world’s leading luxury automobiles. The Volvo engine’s quick response with a fully automatic transmission lets drivers maneuver with precision on winding roads, and negotiate tight spots with ease. Marathon Coach Driver Dave Bash has worked in the motorhome industry 25 years and has been with the company for 18. “I came here because the quality was better than anything else I’d seen, and it still is,” explained Dave. Aside from delivering coaches to Marathon’s facilities in Florida and Texas, to new owners throughout the country, to event sites, etc., Dave also educates new owners on the finer points of owning a Marathon, including parking and set up, driving and everyday luxury RV life. For generations, professional drivers have celebrated Prevost coaches for their unmatched drivability, precise and secure dynamic qualities, and superior ride characteristics. Prevost is, quite simply, the coach preferred by those who drive for a living. Employing a sophisticated “multiplexed” architecture, the Prevost driver’s environment provides the kind of long-distance comfort and fatigue-free operation that makes an all-day journey a pleasure. 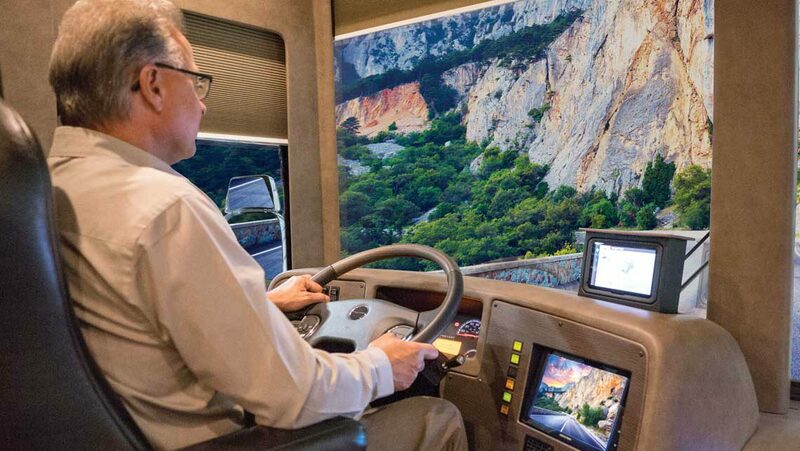 Prevost places frequently used controls such as cruise control, shifting, engine braking, horn actuation and electric sun visor adjustment on the steering wheel for easier driver access. A pneumatic steering column and ergonomically angled steering wheel ensure that all gauges and indicators are easily readable regardless of driver and steering-wheel position. The result is a driver’s environment designed to optimize intuitive operation, safety and comfort. Prevost’s Electronic Stability Program (ESP) electronically compares performance models to actual vehicle movement, ready to provide instant intervention in an emergency maneuver to help a driver maintain control. ESP helps keep the vehicle in proper alignment and reduces any tendency to slide. It also provides improved stability — a safety advantage in high-friction conditions involving curves or sudden steering directional changes. a Marathon coach owner since 1993. Prevost’s independent suspension includes precisely sized and tuned stabilizer bars on not only the front, but also the drive-axles. This design, engineered to complement the ZF Servocom® power steering, provides exceptional directional stability, confidence-inspiring road feel and best-in-class handling precision. The Volvo D13 engine delivers impressive performance with excellent low-end torque. The result is more driver control, great load management and remarkable drivability with outstanding fuel economy and very low impact on the environment. Keeping a safe distance behind a vehicle is one way to avoid collisions. Prevost Aware-Adaptive Cruise Braking by Bendix assists in maintaining a safe following distance. If the distance between the motorcoach and the vehicle it’s following becomes unsafe, the system provides warnings, and when cruise control in engaged, initiates brake applications to assist in keeping a safe distance between both vehicles.